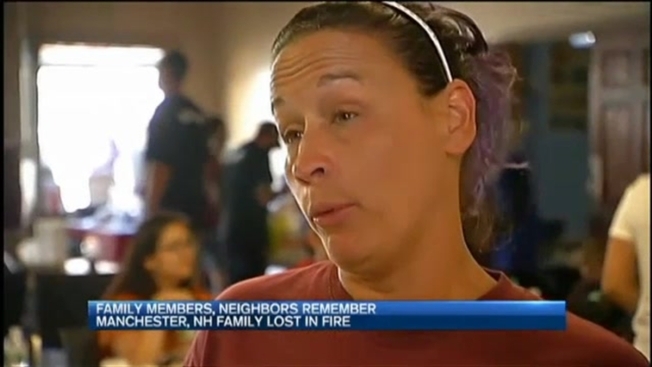 Family members and neighbors are remembering the Manchester, New Hampshire, family that lost their lives in a fast-moving fire early Monday morning. The community came together earlier tonight, as they honored the four lives lost during a vigil. Clutching crayon drawings created by her little brothers, Amy Moody wants to know why her family is gone. "These brothers were my life, they were my children," she said. Joshua Harrison and Aileen Moody were killed this morning in the fire, along with two of their children 10-year-old Joshua Harrison the Second and 8-year-old Jay Michael Garon. Amy Moody is the sister of the little boys and lives down the street. The boys regularly attended the after-school program called Roca Kids Club, where tonight about 200 people gathered to share memories. Jamie Wintle of Roca Kidz Club said, "They were happy boys...always willing to help out to do something." 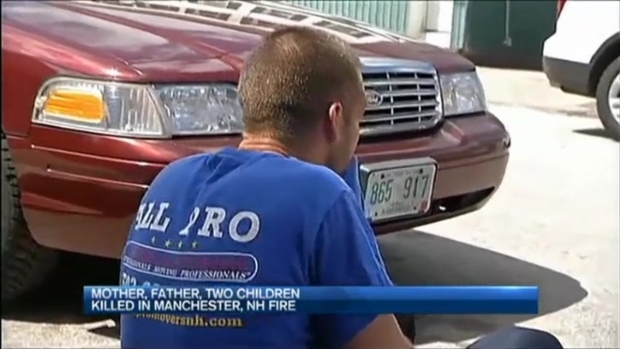 Close family friend Jimmy Day told necn he just saw the family on Sunday. "They always helped people out. They gave people a place to live when they needed it," he said. Meanwhile, Rick Botkin says the children's mother worked at his dry cleaning business for years. The brothers attended Wilson Elementary School, where some students left early so parents and grief counselors could help them process the loss. Faith leaders at a community center where the brothers also spent time, said they are also trying to be there for everyone. The Manchester community center will host parents and children for a pizza night, and use it as a time of prayer and remembrance for the victims. It's unclear what caused the fire, which is still being investigated. The blaze also left 30 people homeless. “I wanna know why…no one really knows yet," said Keyanna Martel, a friend of the victims. Surveillance video showed the fire broke out at the Wilson Street apartment building around 5 this morning. Firefighters said they got there three minutes after the call came in, but it was too late. The family couldn’t get out in time. “This is something I won’t be able to get over. I just know that for a fact," said Amy Moody. The Manchester community center will host parents and children for a pizza night, and use it as a time of prayer and remembrance for the victims. It's still unclear what caused the fire, which is still being investigated. The blaze also left 30 people homeless. Surveillance video showed the fire broke out at the Wilson Street apartment building around 5 this morning. Residents started frantically escaping. Firefighters said they got there three minutes after the call came in, but it was too late. The family couldn’t get out in time. “This is something I won’t be able to get over. I just know that for a fact," said Amy Moody.